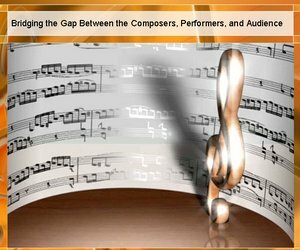 Travis J. Weller and I presented a clinic at the 2009 PMEA conference held in Valley Forge, PA entitled Bridging the Gap Between the Composers, Performers, and the Audience. This presentation outlines some of the reasons that bringing a composer into the classroom (and other similiar “golden opportunities”), whether “physical” or “virtual”, are important to our students -and to us! Briefly in this presentation, we attempted to explain some “common sense”, but usually –never thought about educational and performance related processes that happen during a music performance. Also, to explain the educational impact that many of us never “think” about with regard to how our students perceive these types of special opportunities. The presentation is a “little” cerebral at times and just the same -you may find yourself smiling at the simplicity… The event itself and the survey information we gathered make for a very important qualitative-type study that allows us to gain insight into the minds of the student performers and some of the thoughts behind what the composers hope the audience and performers gain by this type of musical communication and interaction. If the technology allows you to do something with greater efficiency and accuracy, you have very good cause to utilize it. It the technology allows you to give your students an experience or opportunity that is not possible otherwise, you have very good cause to utilize it. We also know that all music educators are networked with academic experts in their field(s). Whether a colleague, friend, or mentor, the opportunities to bring someone into the classroom (using technologies like SKYPE) are readily present and available to anyone who makes the small effort to utilize these technological avenues. There are many reasons that these types of “virtual” experts can be a valued adjunct to our courses. Have you ever thought about having one of your professors “SKYPED” into your public school classroom(s)? The presentation consists of 26 slides. Obviously, much of the dialogue is not present in the presentation itself (as Travis and I talked quite a bit), but it does provide a good outline of what we did and the thought process behind why we decided to present it.